I vivisected some of these outfits and their stock manipulation schemes on the way up. And on January 25, I documented Phase One of the collapse. This is now Phase Two of the collapse. And dip buyers are still not through getting crushed. UBI Blockchain International got totally mangled. When I last wrote about UBIA on January 25, it was down 93% from the peak six weeks earlier. Since then, all heck has broken loose. 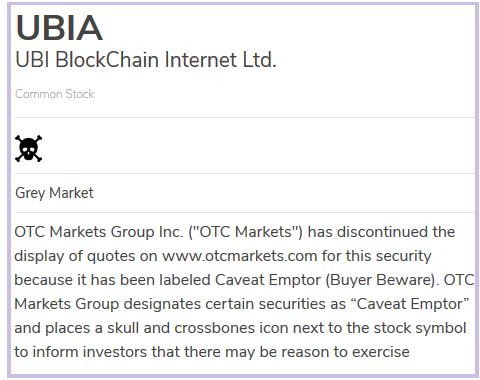 On Friday, OTC Market, where the shares had been demoted to, slapped a “skull-and-crossbones” icon next to the ticker and no longer displays a quote. It started out so promising: Over the course of a few days in mid-December, UBIA skyrocketed 1,500% to $115 a share intraday. December 28, I tarred and feathered the company, its executives, their shenanigans, and their Chinese connection [for details, read, I’m in Awe of How Far the Scams & Stupidities around “Blockchain Stocks” are Going]. January 9, the SEC halted trading in UBIA, for two reasons: lacking “accuracy” in disclosures and funny trading activity. The trading halt froze the share price at $22. January 23, when trading resumed, shares plunged further. January 25, when I last wrote about it, they were at $8.25, down 93% from the peak. February 9, the company disclosed in its quarterly SEC filing that it had zero revenues and a quarterly loss of $1.24 million. It repeated that its ability to go on as a “going concern” depended on getting new financing and its “ability to achieve and maintain profitable operations.” Fat chance. February 15, shares closed at $6, down 95% from the peak. In other words, the normal ways of obtaining a quote – on otcmarkets.com, MarketWatch, Yahoo, Bloomberg, WSJ, etc. – have disappeared. These shares are essentially goners. Riot Blockchain down 75% from the peak. The vultures are circling. This was a failing biotech outfit called Biotix with annual revenues of less than $200,000 over the past four years, generating a total of $34 million in losses. Shares were trading at around $4.50. But on October 4, it announced that it would change its name and start investing in cryptocurrency and blockchain startups. BAM went the shares – up nearly 1,000% to $46.20 by December 19. But by January 25, they’d plunged 61% to $17.92. On Friday, shares plunged 33.4% to $11.46 after CNBC published the results of its investigation into the shenanigans of the executives, a major investor, and the company. As a result of its findings, the firm has prepared, but not yet filed, a proposed class action complaint to recover losses suffered by Riot Blockchain investors. On December 29, 2017, after the market closed and heading into a three-day holiday weekend, John O’Rourke, the Company’s new Chief Executive Officer, made an SEC filing revealing he had sold over 30,000 Riot Blockchain shares. On this news, Riot Blockchain’s stock price declined more than 14% over two trading days. On January 31, 2018, before the market opened, the Wall Street Journal published an article detailing investor Barry Honig’s involvement with Riot Blockchain and his trading of the company’s shares. On the same day, Riot Blockchain announced that its annual shareholder meeting would be postponed for a second time. On this news, Riot Blockchain’s stock price declined more than 14% over two trading days. On February 16, 2018, CNBC reported that Riot Blockchain’s operations raise a number of “red flags,” including: (i) insider selling; (ii) making no apparent effort to timely hold annual shareholder meetings; and (iii) diluting the common stock. On this news, Riot Blockchain’s stock price fell more than 30% during intraday trading. Not that dip buyers won’t plow in and drive up the shares for a little while. But RIOT is likely a goner too. Long Blockchain Corp down 66% from the peak. LBCC is a failing beverage-maker that was called Long Island Iced Tea until December 18. With the name-change announcement, it manipulated its shares up by 360% from $2.06 on December 18 to $9.49 a few days later. This scheme was hatched as the company had received a delisting notice from the Nasdaq, which it disclosed on October 13, 2017 in an SEC filing. The reason was that its market capitalization had dropped below the minimum of $35 million for 30 consecutive trading days. January 5, when it announced that it would sell 1.6 million shares in a secondary offering, shares crashed 21%. January 9, under intense scrutiny, it canceled the stock offering. January 25, when I last wrote about it, shares had plunged 61% from the peak to $3.72 and continued to drop until they hit $2.82 on January 30. Then dip buyers piled in and pushed shares back to $3.63. On Friday, February 16, shares plunged 11% to $3.23. This leaves them down 66% from the peak. What caused the plunge? On Thursday, the company had disclosed in an SEC filing that it had received another delisting notice from the Nasdaq. The company can appeal the delisting. But even if it wins the appeal, it will have to keep its market cap above $35 million for a minimum of 10 trading days in a row by April 9. As of Friday’s close, its market cap was $33 million. Longfin down 76% from the peak. LFIN went public in November. On December 15, the company announced a mix of gobbledygook, hype, and silliness about having acquired a “Blockchain-empowered solutions provider,” namely some website that belonged to a Singapore corporation that is 95% owned by Longfin’s CEO. It didn’t pass the smell test. But shares skyrocketed 2,700% over the three-day period to an intraday high of $142.82 on December 18, pushing the company’s market cap to a fabulous $7 billion and making it the role model of every “blockchain” scammer out there. By January 25, LFIN had plunged 71% to $41.61. On Friday shares plunged 18%. At $34.40, shares are now down 76% from the peak. DPW Holdings down 70% from the peak. This was a penny stock before it came up with its blockchain scam. The company makes power supplies for computers. But when it announced that it would market its power supplies to cryptocurrency miners, shares skyrocketed 880% from $0.56 on November 21 to an intraday high of $5.95 on December 18. On Friday, the stock fell 6.4%. At $1.76, shares have plunged 70% from the peak. On-line Blockchain [OBC] down 44% from the peak. This is another name-change scam. The company was called On-line Plc, a thinly traded penny stock in London. After it changed its name, its shares spiked nearly 1,000%, from 14 pence to 152 pence by January 9. By January 25, shares had plunged 35% from the peak to 97 pence. On Friday, shares dropped 7% and closed at 84.55 pence, down 44% from the peak. Eastman Kodak [KODK] down 47% from the peak. Kodak’s blockchain-and-crypto manipulation scheme wasn’t a name change but an announcement on January 9 of a “blockchain initiative,” including its own cryptocurrency, KodakCoin. Shares soared 300% in two days, from $3.10 to $12.40. Interestingly, on January 8, the day before the announcement, seven independent directors awarded themselves big-fat stock grants. By January 25, shares had dropped 23% from the peak to $9.50. On Friday, shares dropped 7.8% to $6.55, and are down 47% from the peak. Seven Stars Cloud Group [SSC] down 55% from the peak. The Chinese video-on-demand outfit, which is traded on the Nasdaq, manipulated its shares up by 200% from $2.33 on December 8 to $7.00 intraday on December 26, by claiming that it had taken a 27% stake in The Delaware Board of Trade Holdings, a private company. By January 25, shares had plunged 40% to $4.13. On Friday, they dropped 4.5% to $3.17 and are down 55% from the peak. Siebert Financial Corp [SIEB] down 63% from the peak. Its shares had jumped nearly 400%, from $4.40 to $21.64 by December 21 after the 50-year-old New York brokerage announced on December 14 that it would venture into cryptocurrency trading. By January 25, they’d plunged 54% from the peak to $9.65. On Friday, they dropped 4% to $8.10, down 63% from the peak. This amazing spectacle – these scams that caused stocks to soar and plunge over a period of four months – was brought to you by the greatest central-bank-fueled market ebullience and speculative fever mankind may have ever seen. And it may be a sign that the fever has broken. Was the selloff in stocks just a brief correction, or a sign of greater significance? Read… What’s Going on with Stocks, Gold, Silver, Oil, and Mortgages? This entry was posted in Guest Post, Ridiculously obvious scams, Technology and innovation on February 19, 2018 by Yves Smith. Eastman Kodak… Sigh. A brilliant company reduced to turning blockchain tricks by clueless management. I shot a few frames of Tri-X, Kodak’s archetypal black and white film, in my old Rolleiflex TLR today. I too was shocked to see the Kodak name associated with these artifices. It is so far from the knitting of Kodak. I hypothesize what is left of Kodak to be a Hollywood contract to buy movie film that keeps them still making it, and some Star Wars DOD, work, leaving “Management” to do so little they make up play money. I’ve not seen anything for over a year about Goldman Sachs SETLcoin. I wonder if it is pushed back and more a patent on their shelves waiting for some sort of maturity to cryptocurrency. So far it appears that cryptocurrency peaked as useful some years ago with its use within a deeper part of the web where taken on the Silk Road for drugs. The idea that a currency is the transaction record & at the same time anonymous doesn’t square well. Cash cards would appear to me to be more anonymous. At least then the number simply can be expired. While I am no fan of Goldman Sachs it would appear to me to be where to look to measure the worth of bitcoin wannabeism. vehicles that accomplish that will be invented. Tri-X was great for low-light situations, but it didn’t do much for bringing out the grays. If you wanted black and white, you were good to go. Plus-X? Great gray coverage, but you couldn’t push that film’s ASA to save your life! Tri-X defaulted to ASA 400, but I pushed it up to 800 on a regular basis. Especially when I was doing shoots in my high school gym. Good times, good times! Thanks for bringing back the memories, integer. FWIW, Tri-X @ 200, developed in d76 or xtol, has a great tonal scale imo. A stop more exposure and a little less development tames the midtone contrast a bit. That said, from a technical perspective, Kodak’s new version of Tmax400 is probably the best black and white film ever made. Ilford’s Delta100 is pretty great too. Adding “blockchain” to the company name in 2018 == adding “.com” to the company name in 1998. Is there no sector identifier under “.con,” as opposed to “.com,” it would seem appropriate that there should be. Sounds like a bunch of scumbags saw that bitcoin stocks were headed to the wood chippers in 2018 and so tried to get a piece of the action with the associated blockchain hype before it got too late. That four months window that Wolf Richter talked about sounds like a very narrow one but it seems to have paid off for them. In the future, all securities are easily manipulated penny stocks. Like deregulation yet? And IPO of all types have always been pirates, due to limited availability. In the desperate search for yield, ultimately all funds go to zero, because the House always wins at the Casino. I don’t follow market shenanigans enough to know if re-branding penny stocks is routinely a thing. The biotech company that returned as a blockchain company? How does that not get a company instantly de-listed from public markets? And who the hell is really buying this crap other than algo-based traders? Algos are like corporations, they are people, but they can’t be arrested. Whatever the real purpose behind the financial markets, and their manipulation, it isn’t what the public thinks it is. UBI BlockChina Internet Ltd., the beating heart of the scam. The honest part of that was the toilet paper and its intended use. Except that toilet paper is structurally deficient for its claimed use. Before we label these people scumbags, could we please see the supposed ‘diligence’ that the ‘investors’ performed prior to purchasing shares? Excuse me but how does a lack of due diligence on the part of investors absolve a third party of fraud? IIRC you, or maybe someone else here at NC, coined the phrase “prosecution futures” for all this crypto-scam stuff very early on. So a little victory jig maybe in order. I think the item to look at here is DPW Holdings. All the others are obviously scams out to take advantage of the headlines to score some quick looting. DPW sells an actual product and announced it was going to sell to crypto miners. That’s supposed to be an actual market. DPW still tanked, apparently because the market didn’t materialize. That would be a good indication there’s really no there there. Certainly revolutionizing business operations, accounting, and transparency. solid summary, eager to learn more. Found http://bit.ly/2oTenIZ to be a great source for blockchain and crypto market projections. Anyone have a great source for reading an in-depth crypto mining description?